Over its history, MeteoNews in Switzerland has evolved from a classic weather forecasting company to a provider of integrated, flexible, and attractive weather solutions for a wide range of market segments. Today, MeteoNews offers a finished, turnkey broadcast weather segment targeted to smaller and medium-sized local and regional TV stations and online TV services. In order to meet its broadcast customers’ requirements, MeteoNews produces a few dozen hosted weather segments daily in both French and German. With a constantly busy production studio, and operating with a shoestring crew, MeteoNews was looking to fully automate its production and remove as much of the burden as possible from its small technical crew. ChyronHego’s Live Compositor proved to be the ideal solution. Working in sync with MeteoNews’ own software, Live Compositor automates everything from cameras and lighting to the teleprompter and recording software. MeteoNews weather presenters are now able to create their own shows without any intervention from the technical staff. They write their script, walk into the studio, and record their weather segment using a single remote device. ”Live Compositor is a stable solution that gives us the peace of mind to run our production operation with minimal human intervention. 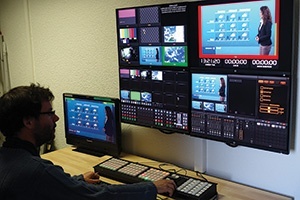 It lets us do much more with less as we continue to grow our production and broadcast capabilities,” said Beat Vontobel, chief technology officer at MeteoNews. Want to know more? Read the full case study. TV Production made easy at ITN. Remote production saves you time and money.